Special skill(s): Any ❖ Federation personnel. Characteristics: affiliation, Classic films , Constitution Class, Tractor Beam, Federation ship, ❖ ship. Requires: affiliation, Classic films . 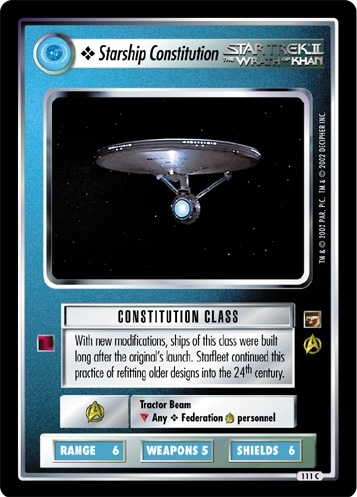 There are 15 entries for Starship Constitution (ST1E 15 C 111) at the Tradeplace (34 haves and 9 wants). Click here to see all trade list entries for this Common card!